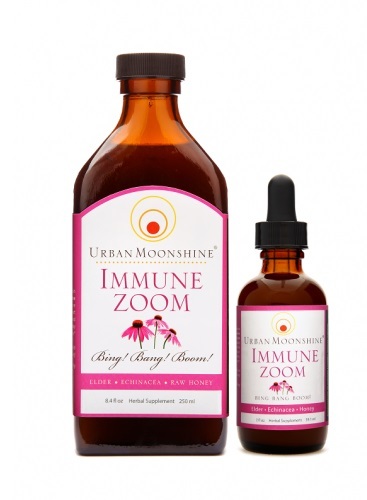 Our Immune Zoom is a delicious combination of organic elderberries, echinacea and raw honey. Help your body's immunity with these time-honored whole plants. We add spicy warming herbs cinnamon, cayenne, & ginger as an extra kick. Use it when you need it! * Made with all organic herbs and raw, Vermont honey! The herbs in our Immune Zoom formula are traditionally used to support the immune system and maintain a healthy immune response. * Made with Organic Herbs & Raw Vermont Honey! We add spicy warming herbs like organic cinnamon, cayenne, & ginger as an extra kick. To stimulate a healthy immune response, take 1 teaspoon (4.9mL) straight or in a little warm water every 2-3 hours. 2 droppers full equal 1 teaspoon. There are about 12 servings in a 2oz. (59.1mL) dropper bottle and about 50 servings in an 8.4oz (250 mL) apothecary bottle. This entry was posted in News, Newsletter, Personal Care, Product Review and tagged botanicals, immune, immune zoom, urban moonshine on March 27, 2014 by Frank.